Salar de Uyuni is the world's largest salt flat, which exists courtesy of a prehistoric lake that went dry. This region is one of Bolivia's most spectacular natural attractions, and is a photographer's delight. Its surreal landscape combines salt pans, wandering llamas and wind-eroded rock formations. A landmass covered in towering cacti called, Isla de Pescadores (the Pescadores Islands), lies in the middle. Laguna Colorada and Laguna Verde are other isolated marvels in Salar de Uyuni. One is a fiery-red lake; the other is a deep blue. Both are inhabited by flamingos and surrounded by extinct volcanoes. Nearby Sol de Manana reeks of sulphurous gases from geysers, fumaroles and bubbling mud-pools. 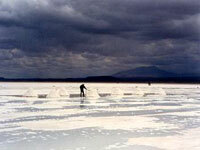 The village of Uyuni is located to the southeast of the Salar, and is the best base from which to explore the area. Travellers can arrange tours from there. 'Salt Hotels' around the periphery of Salar are a unique form of accommodation, where everything (walls, furniture, etc.) is made from salt blocks cut from the flats.